Keeping up with all the boozy beverages you like can be difficult even if you’re in the industry. Finding new ones to try can be even more difficult, especially if your memory for drink names isn’t what it used to be. Luckily, there are apps for that. To help you continue to drink smarter—not harder—we’ve put together a list of apps that will help you make the hard decisions about the hard stuff. Curious winos, beer lovers, and cocktail aficionados, rejoice! Many sommeliers use Delectable to catalog their drinking experiences. Scan wine labels to access Delectable's database of reviews, ratings, and descriptions. To keep track of your favorites, leave your own reviews. If you get thirsty while browsing, tap the shopping bag icon to install Delectable's Banquet app for one-touch ordering. Similar to Delectable, Vivino also allows you to compare two wines and comparison shop—it shows you the best deals on the web. You can also scan the wine list at a restaurant in order to find the highest-rated bottle on the list. Beer more your bag? 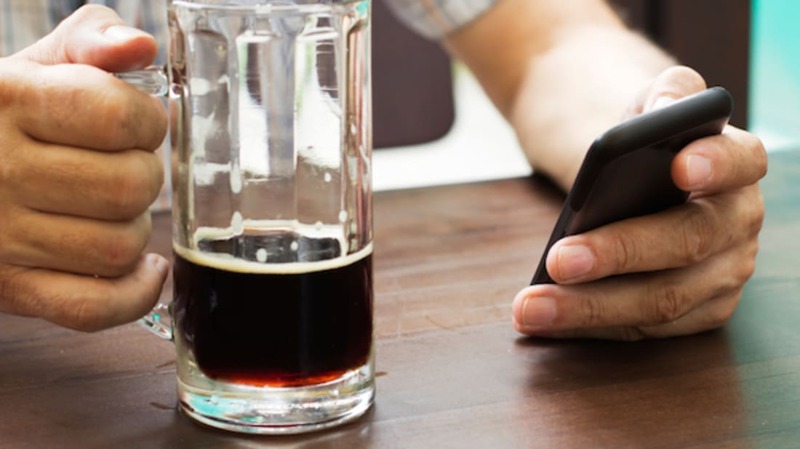 Download Untappd to tap into a social network of beer lovers. Earn badges, connect with other hop heads, and find beers and bars near you. In recent years, craft breweries have popped up in even the smallest towns. This bare bones app allows you to track down nearby breweries, buy beer, join beer clubs, and book tastings. Stamp your digital passport each time you visit a new brewery to keep track of your travels. Tracking down your favorite bartender has never been easier. onthebar lets you create a profile based on what you usually drink and then gives you an "insider's look" at your local bar scene in order to help you find your new go-to watering hole. Find out where the industry's top bartenders are working working and when they’re on shift. Or, ask the bar to save you a seat (limited offering) or send the bartender your ETA. It also works as a social network, letting you connect with others, like bartenders’ drinks, and tell your friends when you visit a bar. Whether you’re at home or at the bar, remembering what you’re drinking becomes increasingly challenging with each sip. If you’re looking to record the fancy concoctions you try during your night out in one place, grab BarNotes. When you get home, browse the recipes (compiled from professionals and armchair mixologists alike) to make your favorites for yourself. If you’d rather stay home and make a drink out of what you have in the cupboard, Mixology may be the app for you. Search for recipes based on what you have in your liquor cabinet, or if you’re feeling lucky, use Mixology's "Random" feature to have a cocktail generated for you based your selected criteria, such as liquor and glass type. As much as it hurts to spend $10 on an app, Speakeasy Cocktails is a great option if you’re looking to step deep into the world of craft cocktails. With video tutorials and hundreds of recipes, the content alone surpasses what most others can offer. When Distiller first launched in 2014, it only covered whiskey. But since they relaunched last year, they’ve offered reviews, recommendations, and information about all dark spirits.